Sorry for the lack of posts recently – I’ve been snowed under with Finals. Have a mini-break now before the last exam and last paper at the end of this next week, so catching up a little! Also, in case you didn’t know from me practically shouting about it to the heavens, my post David’s Pappardelle was recently selected to be one of Foodbuzz‘s Top 9! So thank you! I’ve never had much of a sweet tooth. In fact, of all the candy in the world, chocolate is probably my least favourite. When I was at school and we had a tuck shop (I think this is a very British concept – it’s a school-run snack store that’s open during break (recess), lunch and after-school) all of my friends used to buy chocolate bars, and I would maybe buy a packet of crisps or a soda. I just didn’t get the appeal of chocolate – I don’t like the flavour that’s left in your mouth afterwards, or the sticky gungy feeling at the back of your throat. I also wasn’t a huge fan of the brownie. My experience of brownies were dry, big fat chunks of tasteless cake, a bitter cocoa flavour and distinct feeling of dissatisfaction afterwards. 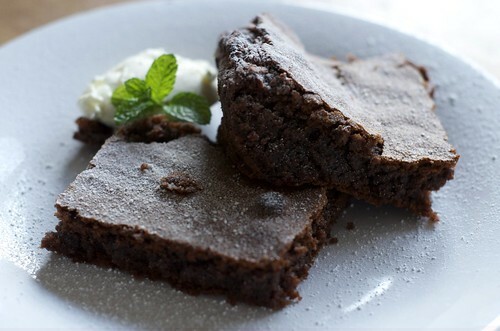 That is, until very recently, when I discovered this brownie recipe which apparently was Katherine Hepburn’s family’s. 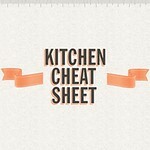 I originally found it on Epicurious.com but have since adapted it slightly to make it mine. I would say that this recipe is fool-proof – both times that I’ve made it they’ve turned out perfectly – but when I gave it to my best friend to tackle whilst I baked some bread, she somehow managed to turn the whole thing into a giant, greasy slab of weirdness. So this might not be all that fool-proof, but it’s still easy-peasy-lemon-squeezy. The original recipe has chopped walnuts in it too, but I omitted these because I’m not a massive fan of nuts in my sweets, either. Feel free to put them back in, though – roughly chop a handful of walnuts and incorporate this when you stir in the flour and salt. 1. Pre-heat the oven to 180 degree celsius. Butter and flour an 8×8″ pan. 2. Melt together the butter and chocolate, being careful not to burn the chocolate. 3. Stir in the sugar, add the eggs and vanilla, and beat the mixture well. 4. Stir in flour and salt. 5. Bake the brownies in the oven for about 30-40 mins, depending on how moist you like your brownies. 6. Cool in the tin, cut into squares and stuff your face. Try it out – best served warm with either a scoop of vanilla ice-cream, or a blob of creme fraiche and some fresh fruit, like summer berries, or raspberries. Until next time, have a good one and, as always, peace and love. sounds like a great brownie recipe….I will have to try it! Oh do, it honestly is the best brownie recipe I've ever tried! Do you eat gooey brownies with ice cream in England? That is popular in America. It may not be fool-proof for me. I'm so much better at cooking than baking. That's actually a wee blob of creme fraiche, but we do eat ice-cream with brownies! In fact, I'm serving these babies tonight with ice-cream for a wee dinner party I'm having. Try it out, it could've just been bad luck that they got messed up when my bestie tried to make them!